Don't forget to ask to see a Sport model. We bet you'll like the way it looks better than the other models—unless you're a hard-core off-roader. And in that case, you should consider a vehicle like the FJ Cruiser. Though it might wear a spare tire on its tail like the hard-core SUVs of yore, don't let that throw you off. 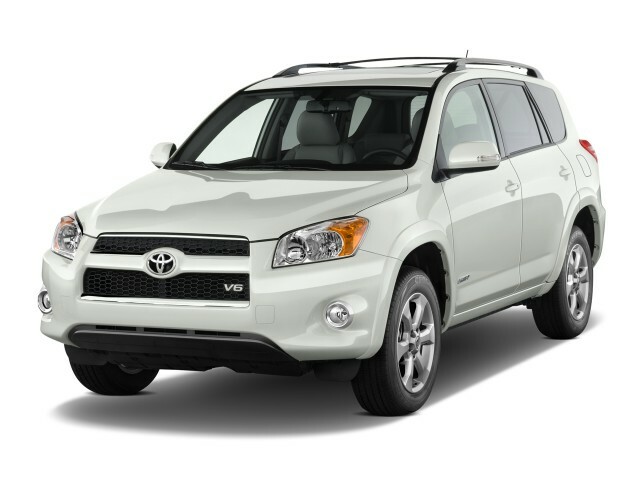 The 2010 Toyota RAV4 is actually a practical, fuel-efficient choice for frugal families on the go. TheCarConnection.com has searched the Web for some of the most insightful reviews from reputable sources. In a full review, they've weighed that against the editors' own Bottom Line, which includes firsthand driving impressions and an assessment of how the 2010 Toyota RAV4 measures up against rival models. Toyota can't help but hold on to tradition with its RAV4. Even though it's a modern crossover ute, with much more of an emphasis on roadworthy performance than off-road ability—and three rows of seating—most of the 2010 Toyota RAV4 lineup keeps with a very traditional sport-utility design, including the spare tire hanging off a side-opening rear hatch. Last year, the Toyota RAV4 got a modest redesign, with a restyled grille and front bumper, improved fog light trims, and redesigned tail lights, but it kept its taller, more trucklike stance. For the first time, a Sport Appearance Package makes a move toward a more carlike silhouette, with the rear spare deleted. The powertrain lineup in the 2010 Toyota RAV4 is quite close to what you'll find in the Toyota Camry sedan—which is fine as either choice is responsive yet quite fuel-efficient. A new 179-horsepower, 2.5-liter four-cylinder engine was introduced last year, while a 269-hp, 3.5-liter V-6 remains optional; as such, it's the most powerful vehicle in its class. There's no manual gearbox to be had; V-6 RAV4 models have a five-speed automatic, while four-cylinder models make do just fine with a four-speed auto. In either case, the RAV4 is offered with either front- or four-wheel drive. In the 2010 Toyota RAV4, most drivers will be happy with the four-cylinder base engine, which is smooth and responsive with all but the heaviest loads or toughest mountain grades. The larger engine gives the RAV4 the ability to sprint with hot-rod-like authority or pull off astonishingly quick passes. The RAV4 is sprung quite softly, so enthusiasts won't find much satisfaction in the handling, but it's stable and safe. And ride quality isn't as pitchy as some compact crossovers, thanks to a rather long wheelbase. Though off-road ability isn't a priority in the RAV4, its four-wheel-drive system is a bit more able than rival crossovers, capable of sending as much as 45 percent of torque to the back at up to 25 mph and including a center diff-lock mode. Spacious and well designed, the interior of the 2010 Toyota RAV4 features an attractive two-tier instrument panel, good seats, a nice upright driving position, and plenty of storage spaces. The RAV4 teeters between compact and mid-size, but in any case, it's one of the few vehicles of its stature to offer a third-row seat. The third row officially expands the RAV4's capacity to seven, but that back row is way too small to be used by any adult. For that, you'll need to move up to the larger Highlander. But the seat design doesn't eat up much if any cargo space; when they're not occupied by children, they stow nicely in a recessed area of the cargo floor. The safety story is mostly good for the 2010 Toyota RAV4. It's achieved four- and five-star results in federal crash tests, as well as top "good" ratings for frontal and side impact from the IIHS but a "marginal" rating in the seat-based rear impact category. Driver and front passenger front-seat-mounted side airbags, along with first- and second-row roll-sensing side curtain airbags, are standard on all versions of the 2010 RAV4, as well as electronic stability control and anti-lock brakes. All-wheel drive, stability and traction control, and electric power steering come together in Toyota's VSC system. Models equipped with the third-row seat also come standard with Hill-start Assist Control (HAC) and Downhill Assist Control (DAC)—two features that are derived from what Toyota offers in its off-road-worthy vehicles and would come in quite handy for negotiating a steep, snowy driveway. Base, Sport, and Limited trims of the 2010 Toyota RAV4 are offered for each powertrain. 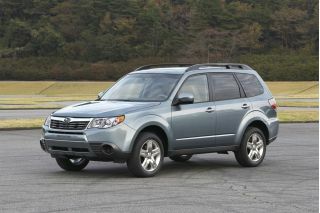 Even base models come well loaded, with air conditioning, keyless entry, cruise control, and a six-speaker sound system. The options list includes an upgraded JBL sound system with Bluetooth interface, heated seats, and a power moonroof. While the Limited model costs several thousand dollars more, it feels considerably more luxurious. The top Limited model adds bigger wheels, fog lamps, a different grille, upgraded seats, dual-zone climate control, and a tonneau cover, among other items. Many buyers will choose the middle Sport model; it includes all the equipment on the Base, plus a sport-tuned suspension, heated mirrors, and appearance extras—the most important of those being the lack of a spare tire hanging on the back. Last year's minor refresh gave a slight boost to good-looking vehicle—made better, in the opinion of TheCarConnection.com, with the Sport model's appearance. The 2010 Toyota RAV4 is cautious and conservative in appearance, no doubt, but last year Toyota introduced several minor updates that help keep this carlike ute looking at least somewhat fresh. Reviewers tend to think that the RAV4 looks a little more rugged than previous versions, but it's not clear whether that's a good thing. 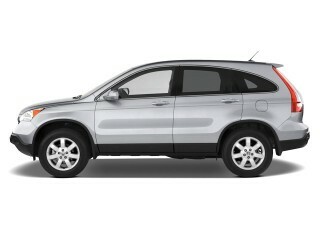 According to Cars.com, "Toyota says the third-generation RAV4's exterior styling follows a 'modern-rugged theme.'" Kelley Blue Book decides that the most recent redesign makes it "more substantial and less 'cute'" than the previous generation, but discovers that typically clean, play-it-safe Toyota styling is the rule, with the exception of "the triangular rear C-pillar and vertically-wrapped taillamps." MyRide notes that "fewer superfluous curves and less cladding" than the previous RAV present "a more finished appearance." A mild refresh given to the RAV4 last year included a slightly different appearance at the front and rear on Base and Limited models, but Toyota introduced an all-new Sport Appearance Package that got rid of the rear-mounted spare for the first time. For this year, it comes with all Sport trims. Toyota doesn't go the traditional route with the interior styling in the 2010 RAV4—especially when it comes to the instrument panel. Kelley Blue Book explains that "the center cluster, door trim and steering wheel spokes are brushed metallic-look plastic," while Car and Driver muses of the sweeping two-tier dash, whose "swollen protuberances at first look Jetson-ish, but in fact break up what would otherwise be a dull sea of plastic." MyRide is critical, calling it a "horizontal gash running the width of the car," with only "a bi-level glove box" as a redeeming feature. Autoblog takes a look around the interior and can't find anything to fault: "No fiddly rockers or digital displays here, just elegant, functional simplicity." Either engine in the 2010 Toyota RAV4 offers good performance and fuel economy, but the V-6 is still the top pick. Last year's new four-cylinder engine makes the RAV4 more refined and appealing than before, but most reviewers voice a strong preference for the smooth, strong V-6 that's available throughout the model line. The RAV4 gained an all-new base engine last year: a 2.5-liter four-cylinder that produces 179 horsepower. It is largely unobtrusive and smooth, and it represents a nice bump over 2008's figures. Edmunds states that the increase in power succeeds in "making it the class leader among rival fours." Another upside is that "fuel economy has increased slightly with this engine as well." Car and Driver reports that "when equipped with the four-banger and front-wheel drive, the RAV4 returns excellent fuel economy of 22 mpg city and 28 mpg highway, albeit at the expense of quick acceleration." The 3.5-liter V-6 that's available throughout the model line is a strong performer, according to every single review read by TheCarConnection.com. Kelley Blue Book says that stepping up to the engine brings "acceleration, pulling and passing power at or near the top of this class." At 269 hp and 246 pound-feet of torque, remarkably, the V-6 counts Edmunds as a fan: "If we were to buy a RAV4, it would have to come with the optional V6." The reviewer notes that fuel economy is almost as good as with the four-cylinder engine. This is partially due to the five-speed auto's extra cog and partially to the V-6's more modern design than the four-cylinder. ConsumerGuide records a 0-60-mph time of 6.7 seconds with an AWD V-6 model, which is positively sparkling performance for an SUV. Several reviewers note that the four-speed automatic transmission included with the four-cylinder engine could use another ratio for improved fuel economy and better response. Autoblog calls the RAV4's automatic "a demerit, making performance feel soft when merging or passing," and misses a manual gearbox with the base engine. The 2010 Toyota RAV4 handles surprisingly well for such a tall, soft-riding vehicle. Base models tend to plow a bit in tight corners, as most front-wheel-drive vehicles do, but the optional Sport models' firmer dampers largely fixed that tendency. "RAV4s have responsive steering and fine straight-line stability," claims ConsumerGuide. "RAV4's linear steering evinced the sort of precision that no one would expect in this segment," say the critics at Car and Driver. The optional AWD system uses electronic control to send power rearward when slippage in front is detected, and "unlike many competitor vehicles," compliments Edmunds, "the RAV4 offers a true 4WD lock feature that fixes the front/rear power split 50/50." Of note, opting for four-wheel drive with the V-6 diminishes mileage by a mere 1 mpg, and only on the highway cycle. Clearly, the V-6's torque works wonders for both acceleration and efficiency. Although the third-row seat in the 2010 Toyota RAV4 is wishful thinking, and the swinging back door is odd, there's very little to gripe about, thanks to a comfortable interior and rugged materials. Other than a handful of minor gripes about materials, very few reviewers have anything negative to say about the Toyota RAV4 with respect to its seating, comfort, and assembly quality. The third row is a joke for adults, though. Seat comfort in the RAV4 is praised by all, with the exception of ConsumerGuide, whose reviewers are "divided on RAV4's seat comfort and driving position," with some testers feeling the latter is too buslike. "The seats look expensive and are comfortable for hours," says Car and Driver, and MyRide remarks, "The front seats are supportive but not overly firm, with modest bolsters and decent thigh support." Kelley Blue Book likes the base model's "durable fabric-covered seats," as well as the "higher-level cloth" that "dresses Limited and Sport models." A couple of other reviewers mention the need for more rearward travel for long-legged drivers. The second row, says ConsumerGuide, offers "ample headroom and legroom...on a comfortable bench." Motor Trend also praises the "triple-folding rear seat that reclines." Toyota stretches and widens the RAV4 enough to squeeze in a third-row seat, but it's a kids-only affair that "requires a high step-in," according to ConsumerGuide. Ergonomics, switchgear, and the quality and fit of parts are generally praised. "The gauges have large, legible markings," proclaims ConsumerGuide, and "the controls are easy to locate and simple to use." MyRide calls the interior materials "Toyota grade, which means excellent," ConsumerGuide, however, takes issue with a "too-flimsy glovebox lid and low-grade headliner material," as well as some squeaks and rattles in their tester examples. Road noise is slightly intrusive, according to some comments. Ride comfort and bump absorption on the fully independent suspension are good, though a bit harsh at times in the Sport model. Motor Trend feels the "ride is really a lot stiffer than it needs to be." "Test models with 17-inch tires showed little impact harshness on sharp bumps and ridges with only mild jitter on washboard surfaces. Sport version with 18-inch tires are not noticeably harsher," reports ConsumerGuide. Although its crash-test scores aren't the best, the 2010 Toyota RAV4 offers reasonably impressive overall safety. The 2010 Toyota RAV4 promises reasonably good occupant protection and a full roster of safety features, though its crash-test ratings aren't quite best-in-class. It achieves top "good" ratings for frontal and side impact from the IIHS but a "marginal" rating in the seat-based rear impact category. NHTSA awards the RAV4 five out of five stars for driver protection in frontal impacts, and for front- and rear-occupant protection in side impacts. It earns four stars for front passenger protection in frontal impacts, as well as rollover resistance and rollover crash protection. 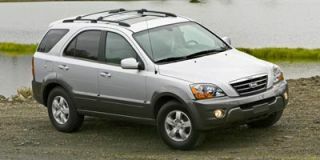 Driver and front passenger front-seat-mounted side airbags, along with first- and second-row roll-sensing side curtain airbags, are standard on all versions of the 2010 RAV4, as are electronic stability control and anti-lock brakes. All-wheel drive, stability and traction control, and electric power steering come together in Toyota's VSC system. Models equipped with the third-row seat also come standard with Hill-start Assist Control (HAC) and Downhill Assist Control (DAC)—two features that are derived from what Toyota offers in its off-road-worthy vehicles and would come in quite handy for negotiating a steep, snowy driveway. The 2010 Toyota RAV4 offers most—though not all—of the features that budget-minded shoppers are looking for in this class of vehicle. There's no mistaking the 2010 Toyota RAV4 for a luxury model, but it comes very well equipped, with three different trims offered with each powertrain possibility, covering a range from basic and fuel-efficient to luxurious or sporty and powerful. Bottom line prices range from just over $22,000 for the Base model to more than $30,000 for a loaded Limited V6. Edmunds explains that the "third row is optional on the base and Limited trim levels and it increases capacity to seven people." Hill Assist Control (HAC) and Downhill Assist Control (DAC)—useful driving aids on- or off-road at low speed—are standard on V-6 models and four-cylinder models with the optional third-row seat. A Lexus-like electroluminescent instrument panel is standard, as are remote keyless entry, an auxiliary jack for the single-CD six-speaker stereo, a tilt/telescoping steering wheel, power mirrors, three 12-volt outlets, 10 cup holders, and cruise control. "The Sport trim gets this plus 18-inch performance tires and wheels, sport suspension, blackout headlamp trim and fender flares," explains Kelley Blue Book. Note that extra styling touches (such as removing the exterior spare tire) can be accomplished by adding the Sport Styling Package. The Sport can also be optioned up with a power moonroof and the JBL audio system. Moving up to the Limited trim gains items such as 17-inch wheels and tires, leather upholstery, a six-disc CD changer, dual-zone automatic climate control, audio controls for the steering wheel, and an eight-way power driver's seat. The Limited's features may be increased to include leather seating areas, heated front seats, and the SUV-requisite rear seat DVD entertainment system to keep the kids entertained. Also on the options list is a package that increases towing capacity to 3,500 pounds. But it's a disappointment that a Bluetooth hands-free system is only offered as a port-installed option if you don't select the JBL system. 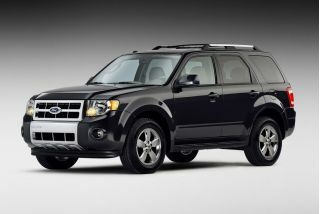 Although many shoppers—along with the editors of TheCarConnection.com—prefer the look offered in the Sport model, with the spare tire removed from the back hatch, there are some benefits to the off-road appearance. For one, the cargo area offers more space. Autoblog points out, "There's even a cargo organizer at the base of the second row seatbacks," and mentions the deep well where the space would otherwise be. I currently have 74,000 miles on my rav4. I repacked the brakes at 60,000 miles and the tires at 45,000. Other than that it's been regular oil changes every 3-4,000 miles. The seating in the limited is very... I currently have 74,000 miles on my rav4. I repacked the brakes at 60,000 miles and the tires at 45,000. Other than that it's been regular oil changes every 3-4,000 miles. The seating in the limited is very comfortable. Heated seats and remote start are options I can't do without in the northeast.